The European Union (EU) has by far the world's strictest standards concerning allowable pesticide levels that can be found on imported teas. So strict in fact, that many, if not most organically grown teas cannot pass the rigid screening. A random sample of each large shipment of tea must be tested before it is shipped, and then re-tested before it is allowed to enter the country. It is not uncommon for whole container loads of tea to be shipped back to the country of origin. This tea is qualified to be sold and consumed in accordance with EU Regulations. 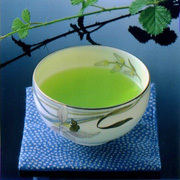 The best part is that it is a great tasting Japanese green tea. European Sencha (Deep Steamed) has a thicker-richer taste and darker green colored liquid when compared to European Sencha. Brewing instructions are not printed on Consumer (Bulk) packages. Please see the How To Brew page for brewing instructions. Deep Steamed European Sencha brews exactly like Premium Sencha. 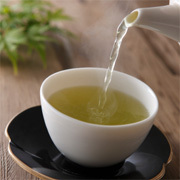 During processing deep steamed tea is steamed approximately one minute longer than regular Japanese green tea. This sounds like a simple procedure, but actually it takes great skill and knowledge, such that most tea companies in Japan are unable to do it. Deep steaming causes tea leaves to lose their "leaf shape" and become separated. That makes this tea appear more powdery than others. When brewed, it also results in the thick-rich and dark green color liquid.